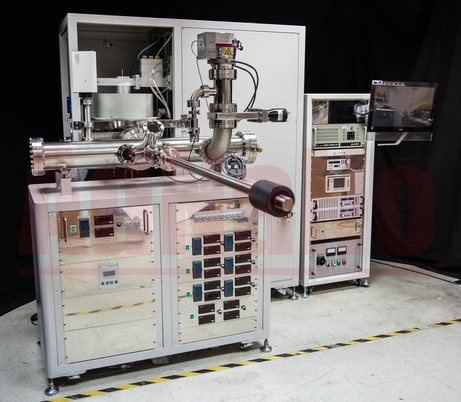 AdNaNoTek's Microwave Plasma Enhanced Chemical Vapor Deposition (MW-PECVD) is a deposition technique used for producing high quality epitaxial (atomic layer) thin film using controlled and programmed gas precursors inputs. 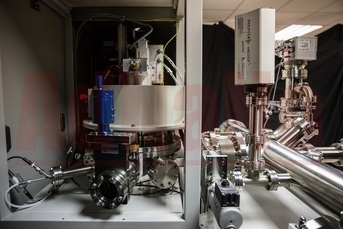 This PECVD system is uniquely equipped with Electron Cyclotron Resonance (ECR) which uses microwave to produce successive ionization, vibrational excitation, and collision among gas molecules, and consequently generating plasma. Sufficient precursor units are provided to introduce deposition materials unto the substrate using a sophisticated gas control panel. The deposition chamber and substrate manipulator provides precise control of vacuum condition and substrate temperature to ensure high quality deposition process. Since the substrate heater can be heated up to preset temperature.